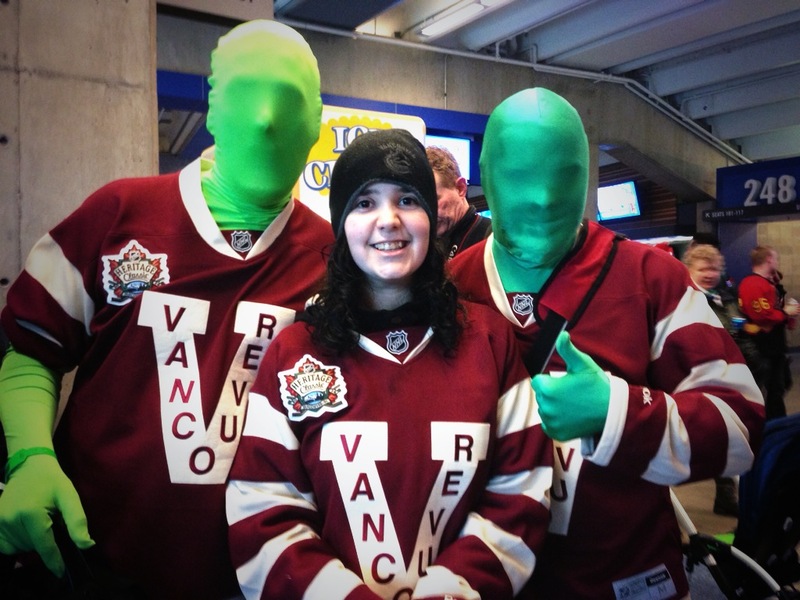 Love them or hate them, Vancouver’s Green Men stole the hearts of Canucks fans for the last five years with their dedication and in-game antics for their love of the sport and their team over the years. On November 7, 2014, they announced that the 2014-2015 NHL season will be their last season of suiting up as the Green Men. December 22, 2009 may have seemed like any other game for other fans but I will forever remember THAT game because of two fans in bright green full body suits near the penalty box that somehow were able to entrance the entire arena with their support for the team. They made the in-game atmosphere even more electric and the crowd was that much louder. Many games have been played since that fateful game and nearly five years later these two are still rocking the green suits while cheering on the Canucks. Their appearances grew more frequent as did their fan following in the years that followed. Thank-you for giving this team and this city so many great memories that we will never forget! Some may have thought you were crazy when you first started out on this journey, but this kid always thought you guys were pretty awesome! How much more epic could this moment be? Celebrating a massive game (54 saves from LU) that sent the team to the Finals for the first time since 1994? You never lacked creativity when it came to trying to get in the heads of the Canucks opponents (all in good humor) in the penalty box. Meeting these two A-list stars, looked like a pretty awesome moment from those looking in from the outside! Ah yes, how can we forget about your love for making all things Vince Vaughn in Canucks colours. I absolutely loved every moment that came before this farewell season news and I look forward to the moments still to come in this final countdown of your Green Men journey. My favourite characteristic of you as the Green Men is how committed you were to supporting the team and how welcoming you were to other fans in the sport. Thank-you, Force and Sully for many unforgettable moments over the years and I wish you the best of luck in your very bright future as you move forward! It isn’t easy being green, but you sure made it look seamless! This entry was posted in Vancouver Canucks and tagged Force and Sully, Green Men, hockey, NHL, super fans, Vancouver, Vancouver Canucks by sarahlaug. Bookmark the permalink.